It takes a pragmatic look at what you can expect, one of the conclusions being that finding an ex unconverted barge today in a suitable size is rare, so be prepared to consider how someone else’s conversion might suit your needs or to build a new one. One of the conclusions is an ideal size of 60 ft x 12 ½ ft x 6 ½ ft air draft will allow you cruise most of the places in England, Scotland, Ireland, France and find routes through Belgium and the Netherlands. The focus is on English and Dutch barges because these are the most common available in the size range. Various types are discussed and their characteristics, from hull shapes, engines, navigation, cruising range, accommodation, regulations, qualifications required and safety. The questions to ask before you tackle a conversion are covered and what should be considered in the way of electrical, heating and water systems, lining options and domestic equipment. And after all those decisions have been made, it goes into the cost of ownership and maintenance. The RCD categories and barge completion levels are discussed for new builds. There’s some solid advice on the actual purchase process from viewing, obtaining proof of ownership, the purchase transaction, survey and completion. In the Appendices is an Inspection Check List, an excellent document to have when visiting boatyards and making notes, so as not to confuse one offering with another. While there are a couple of references to Ireland, it is aimed at an English speaking audience wishing to cruise for the most part the navigations of England, France, Belgium and the Netherlands. Sterling is used throughout with no attempt to convert to Euros or Dollars, but measurements are referred to both in metres and feet. Perhaps, the next edition might include more references to the choices available in Ireland. 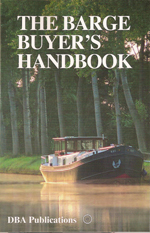 This handbook has very obviously been written by people who have been through the process and is a must if you are considering purchasing a barge in the near future. The Barge Buyer’s Handbook – DBA The Barge Association 2008 – ISBN 978 0 9532819 4 7 available at www.barges.org see Links.